Davos is a massive mountain town and also one of the world’s biggest and best ski areas, though only two of its five ski mountains are linked. From Davos centre a funicular drops skiers on the Weissfluhjoch, 2665m, for the famous Parsenn runs to Gotschnagrat and over and down to the Royal resort of Klosters. There are some great yo-yo skiing and long cruises up in the mountains, but the area majors on its seriously long, yet undemanding runs from the Weissfluhjoch to the valley floor at Klublis and Serneus, 12km of thighburning, family boring slopes. Indeed, so long are the runs that Davos on some of the wide-open deserted stretches, there is such an absence of crowds, you could feel lost. Worry not, although the piste signposting is not perfect, after what seems like a lifetime going down you’ll see the welcoming sign of wood smoke then mountain huts and you’ll enjoy a quick fix before taking a final plunge down to the bottom. Davos also has fine intermediate skiing on the Jakobshorn, from the town on the opposite side of the Valley, and on the Rinerhorn, just five minutes by bus. The entire circuit is best for intermediates because a glance at the lift map will tell you that there are great cruising and gentle runs everywhere. That said, advanced skiers have plenty to challenge them, particularly some very good off-pistes and the infamous Wang down to Klosters, when it’s open. Klosters was made famous by Prince Charles’s annual trip with his family. 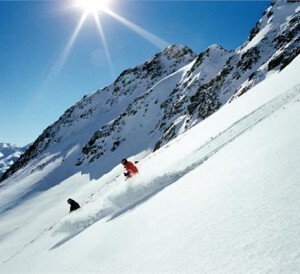 It shares Davos’ vast mountain ski area and also has its own separate mountain above, the Madrisa. The resort is a small quiet former farming village gentrified nowadays with expensive hotels and architecture.